Pentecostal Holiness Church. Front-gabled brick sanctuary, 1 bay wide and 7 bays deep, with a Gothic arched entrance and an octagonal stained glass window in the upper facade. Side windows have stained glass sashes. Flanking 1-story wings are apparently original. 1940-1960 CDs: Pentecostal Holiness Church. 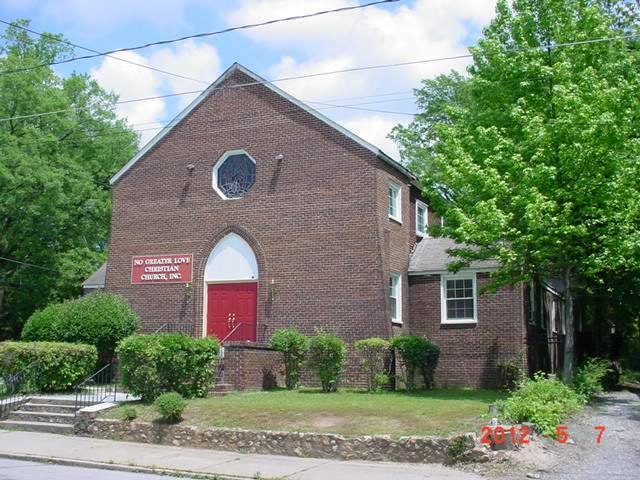 This has since been occupied by Interfaith Outreach ministries, and as of 2013 is occupied by "No Greater Love Christian Outreach." NC Education Building. Ca. 1970. 2-story flat-roofed brick building with a wide decorative brick entrance surround and metal casement windows.